Bo Butner, Robert Hight and Doug Kalitta celebrate wins. 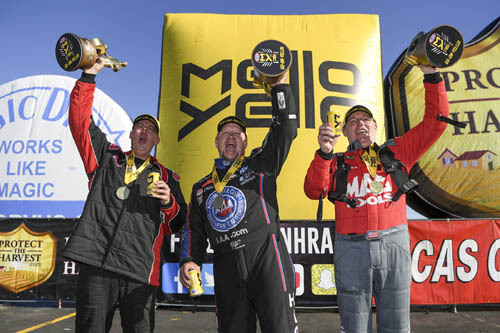 POMONA, Calif. - The season-opening event of the 2019 NHRA Mello Yello Drag Racing Series concluded Monday at the 59th annual Lucas Oil NHRA Winternationals presented by ProtectTheHarvest.com at Auto Club Raceway at Pomona. 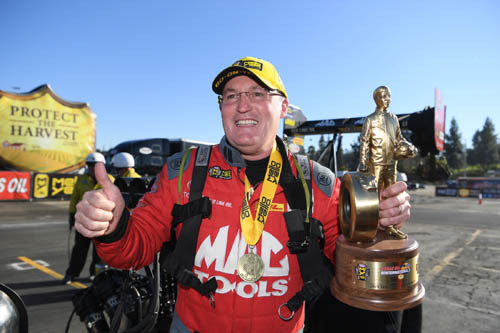 Doug Kalitta celebrates his back-to-back Winternationals win. "This place has always been very special for me," Kalitta stated. "To have success here is more than you could imagine for me. We were fortunate to get by the Capco guys but we're going to keep at it. We are really hungry, and we've got Rob (Flynn, crew chief) and Troy (Fasching, crew chief) doing just an awesome job. I'm just really proud of them." 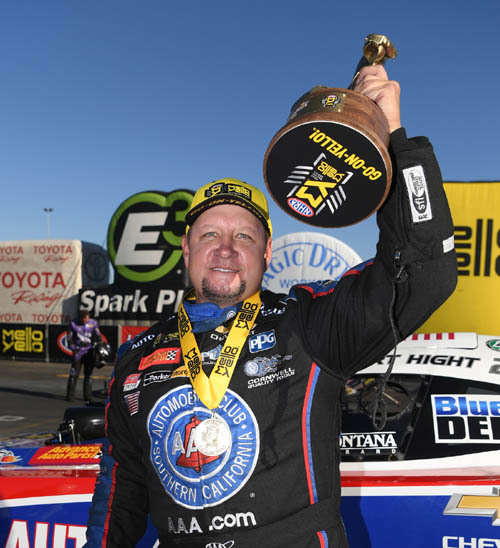 Robert Hight celebrates his fourth Winternationals win. 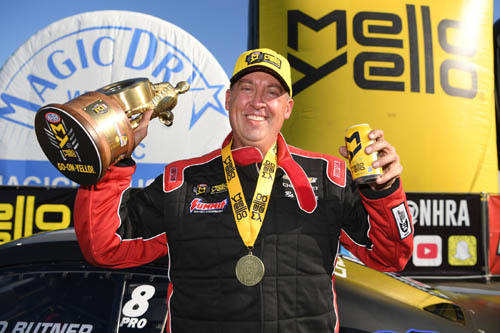 "You look at the Funny Car class and I think its tougher this year than last," Hight said. "To come out here and be the No. 1 qualifier and win the race, that's quite an accomplishment for this team. We're going to have to be on our game all year long." Bo Butner celebrates his back-to-back Winternationals win. In Pro stock, this was a rematch of the 2018 Winternationals. Butner defended his event title against teammate Jason Line after driving to a 6.522 at 211.59 run in his Jim Butner's Auto Chevrolet Camaro. He locked in his eighth career victory. "We were really struggling during qualifying," Butner stated. "I definitely feel like we had the best car all four rounds today. I feel like we have a great car and team this year and I'm looking forward to keep going. We're going to try and win them and the KB Racing team is as strong as ever." Top Fuel -- Doug Kalitta, 4.014 seconds, 269.29 mph def. Steve Torrence, 4.008 seconds, 240.25 mph. Funny Car -- Robert Hight, Chevy Camaro, 3.881, 329.75 def. Jack Beckman, Dodge Charger, 3.880, 329.42. Pro Stock -- Bo Butner, Chevy Camaro, 6.522, 211.59 def. Jason Line, Camaro, 7.160, 148.58. Top Alcohol Dragster -- Shawn Cowie, 5.156, 279.73 def. Matt Sackman, 5.299, 276.18. Top Alcohol Funny Car -- Brian Hough, Chevy Camaro, 5.412, 269.56 def. Doug Gordon, Camaro, 5.498, 273.22. Top Fuel Harley -- Doug Vancil, Weekend, 6.277, 227.34 def. Tii Tharpe, JTR, 6.322, 223.50.